The “Blow Me” mod allows you to extinguish fires in Singleplayer using your microphone. Just blow as hard as you can and the burning catastrophy will be extinct after a certain amount of time. The mod will take your primary voice input device and gather up some data. This data will be evaluated and if your microphone input volume hits a threshold which you can set by calibrating, then all fires within an imaginary cube (with a length of 9 blocks) will be doused. If you run your client with this mod for the first time, then you might notice a GUI, telling you to go calibrate your microphone now. It is highly recommended to calibrate at your first run since it makes things easier in terms of adjusting to the quality of your microphone. If you don’t choose to do so, then you can recalibrate your microphone at any time by pressing the minus key ingame. If the mean input value doesn’t change or stays at 0, please check the connection of your microphone to your PC and adjust the sensitivity of your microphone (by changing the input volume in your mixer). You don’t need to look into this GUI to know what your current mean input level is. You can also draw this into the HUD (ingame). Just click on the “Draw ingame” text to switch between the values “off”, “simple” (above) or “detailed” (below). 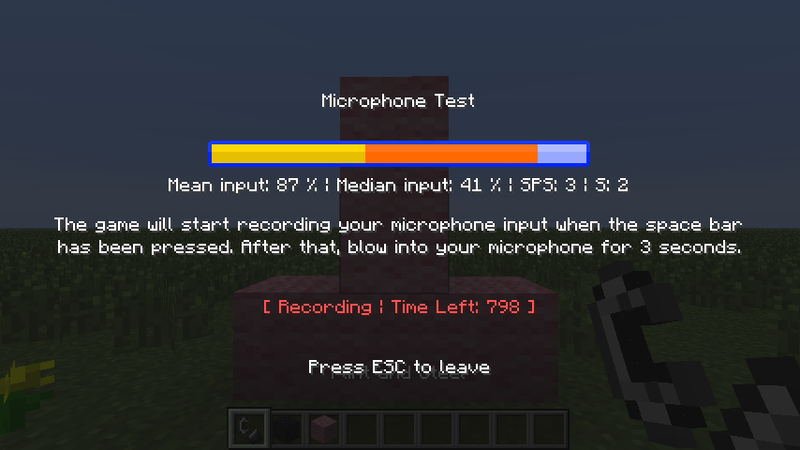 Calibrate your microphone!In the most recent version 1.6.4_2, you are now able to calibrate your microphone. Why? Because I saw a lot of Youtubers having trouble with hitting the 50% mark because of their high-resoulution microphones, so you are now able to calibrate your microphone. 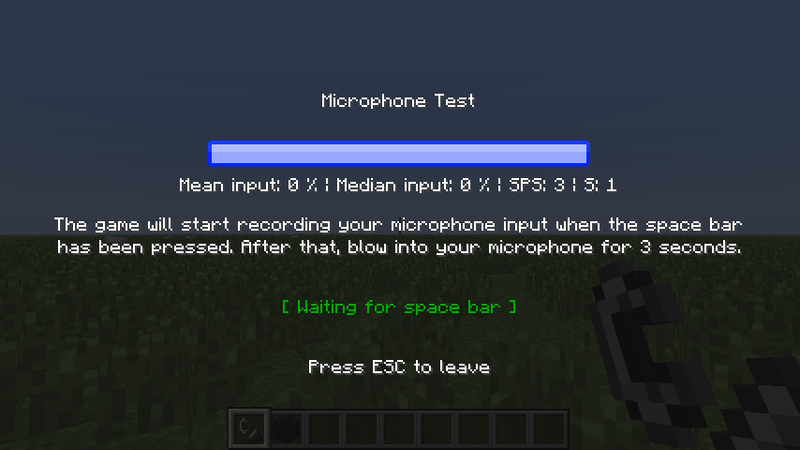 You can access this screen by clicking on the “Calibrate microphone” text in the microphone testing screen. Hit the spacebar and blow into your microphone for three seconds. Not more, not less. Values lower than 10% won’t be registered. In the end you will recieve a result whether the calibration was successful or not. If it was successful, then the new minimum mean input will be displayed in the square brackets.